There are so many incredible locations to photograph a bride and groom in the Plaza Hotel that I hardly know where to begin. This simple location can be easy to overlook - it's not in a grand and fancy location, but when you have a wedding photographer who knows what to look for, even the plainest and less "exciting looking" locations can be truly incredible portrait spots!The first thing that you have to remember about taking wedding pictures at the Plaza is that you'll only be allowed to photograph inside this hotel if you're actually getting married there on that day. 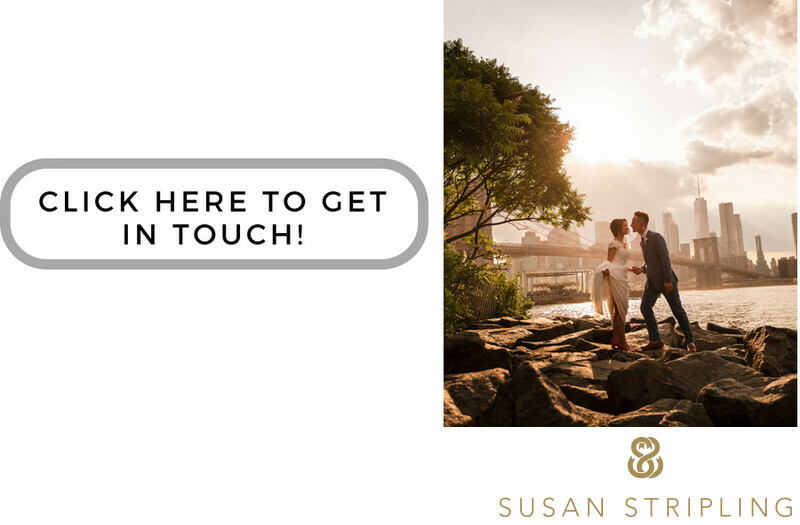 Alongside that, the location that you can photograph are strictly limited as to preserve and protect the privacy of the guests. While I'd love to take pictures in the Palm Court, Champagne Bar, and Rose Club, you're not allowed to take wedding day photographs in those locations. The hotel suites are also great locations for pictures. 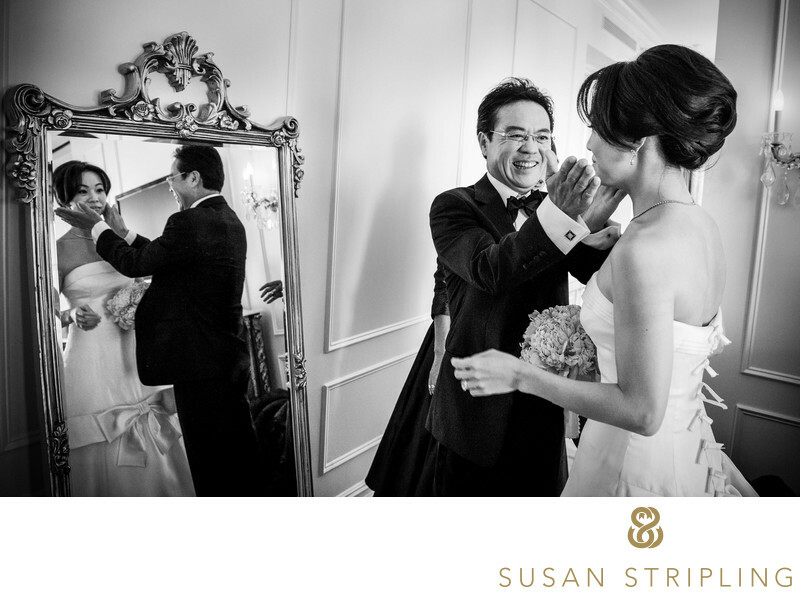 Private and intimate with great light, book a suite and let's take some of your wedding day portraits here! 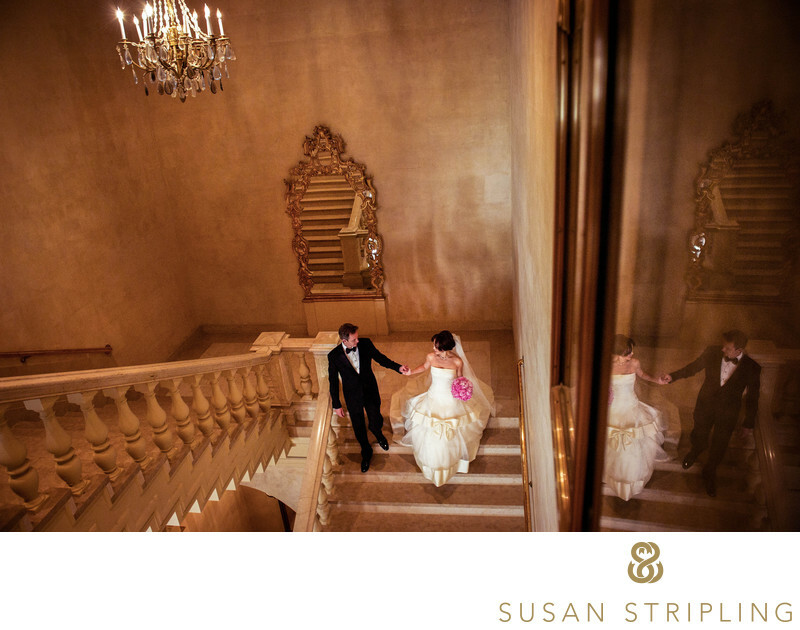 ​​​​​​​​​​​​​​​​​​​One of my absolute favorite locations is the grand staircase near the ballroom. 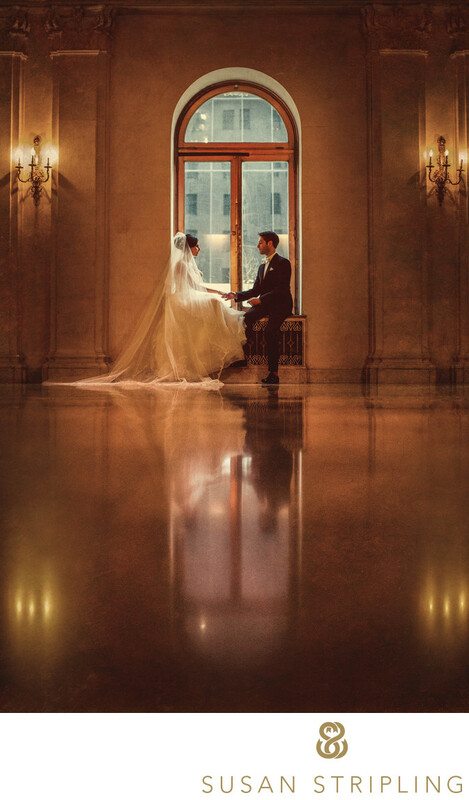 After this delightful bride and groom saw each other for their first look we took a few moments to take some photographs of the two of them at this iconic Manhattan wedding venue. I chose to take this picture from the top of the stairs because I saw the bride and groom reflected in the right side of the frame. I used a wide angle lens so that I could capture the grandeur of the staircase while also including the reflection in the final photograph. My goal when photographing a couple together on their wedding day is to document their relationship without overly posing them in a way that will not feel natural to them. I simply asked the bride and groom to hold hands and take a slow walk down the staircase while continuing to maintain eye contact as much as possible and talking to each other the entire time. This resulted in a final photograph that illustrated the way they naturally interact together. Keywords: New York City (207), The Plaza Hotel (57). 1/160; f/4.5; ISO 4500; 24.0 mm.